Kerri Cushman, Associate Professor of Art, received a faculty research grant to study copperplate etching and letterpress printing at Penland School of Crafts in North Carolina. An edition of five books was produced in the summer of 2011 under the instruction of Bill Hall, master printer at Pace Prints in NYC, and Amy Pirkle of Perkolator Press. 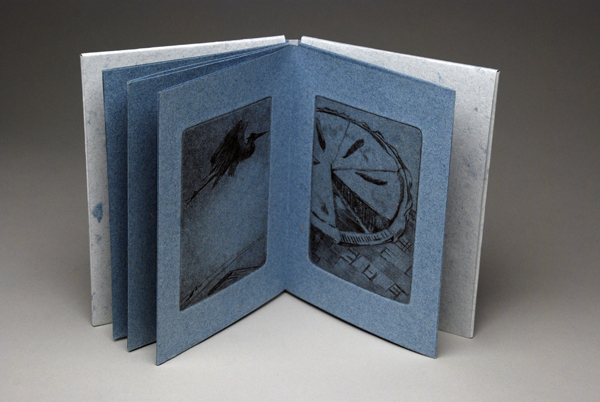 The artist book Balanced, was the result of combining handmade paper and traditional etching with letterpress printing in a contemporary, non-adhesive book structure. Balanced was also featured in the exhibition, BookOpolis, at the Asheville Bookworks Gallery in North Carolina, September 23-24, 2011.